As you all know, we still can not enjoy at our terminals in the latest version of the Android operating system, Ice Cream Sandwich. However, as emerging applications that simulate some aspects of the system. 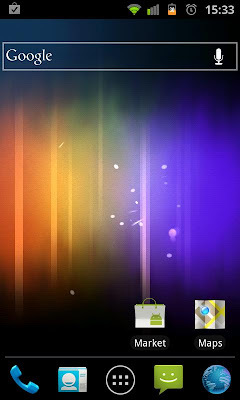 Inspired by the Nexus wallpaper of Android 4.0 Ice Cream Sandwich, is now available on the Android Market. It offers you a beautiful Ice Cream Sandwich experience on your phone. The Ice Cream Sandwich live wallpaper provides a magnificent moving background out of dust,stripes and white particles which are touchable. This live wallpaper runs like a charm on all tested devices due to its RAM efficiency. Here we bring you a live clone of the official wallpaper of Android 4.0, called Beam Phase, which have added some modifications to make it more eye-catching 3D. The animations are very smooth and not distracting at all. The application is free and works great, but beware the battery consumption such as moving desks tend to consume more than normal and each time the terminals have more power and require a larger battery capacity. You can choose between 6 different themes and you can toggle the noise effect, the 3D scrolling effect, the touch effects and the fade in effect. Additionally you can change the colors for the wallpaper.